Are eggs pasteurized? Short answer is no if you are cracking the egg on the skillet. Shell eggs come straight from the hen. 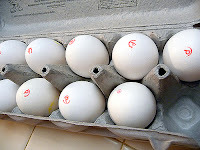 In liquid form "Egg Beaters" and other forms of liquid eggs can be put through the same pasteurization process as milk. There are important lessons from eggs that can be learned regarding raw milk. The recent egg recall is an example of what could happen with the public supply of milk. Eggs (like raw milk) are collected from multitudes of farms and shipped to and packaged at co-ops. From there they are spread through central distribution networks. While higher in nutritional value raw milk is at risk of carrying food borne illness. The thermal treatment of pasteurization followed by refrigeration greatly reduces this risk removes and makes it safe for distribution over wider areas even if there was contamination. No one has ever made the statement that all raw milk carries food borne illness - nor do eggs. Pasteurization simply reduces this risk down to the level that it would be neutralized and digestible if harmful bacteria were to habitate in either. Raw eggs are "unprotected" until recently. Look for the eggs with a P in circle. This denotes one of the few pasteurized eggs on the market. Locate a store with pasteurized eggs by clicking this link. Unpasteurized eggs do not pose a threat if they are seriously cooked. Pasteurized eggs are particularly recommended for infants, senior citizens, and pregnant women - the three classifications that run the most risk from the impacts of salmonella. The USDA fact sheet on salmonella can be located here. If like your eggs runny (particularly if your pregnant) and / or put raw eggs into other formats (like Caesar dressing) consider pasteurized eggs.